Who are we? - We are Keith and Alan, a couple of guys that want to share our two main passions, Motorbikes and the Highlands of Scotland. What do we do? - We have listed some of our popular motorcycle tours to whet your appetite, but ultimately they can all be adapted and made bespoke to you and your party for your enjoyment. Ultimately its our job to make your tour safe & fantastic and be on hand to deal with any eventuality. How do we do it? - Our tours are open to anyone and everyone with a motorcycle licence. You can either join us with your own motorbike or we can source one for you at a competitive price. All bikes we supply are well maintained new models, with comprehensive insurance and full safety gear is also included for your comfort. Where do we do it? - We have a comprehensive local knowledge of Scotland and particularly the Highland and Island areas which include the popular North Coast 500 Route ( NC500 ) as well as the Hebrides. The routes we select will show you what the legendary area has to offer in roads and scenery you may miss doing it solo. We cannot promise a sighting of Nessie but can promise a good time with laughs and roads guaranteed to keep your mind and skill level excited. Do you want to do it? - Its easier than you think, contact Keith or Alan using any of our links for info - we can make it happen and we don't bite. What else can we do? - We can also quote for European tours using our own experience, specialising in Austria, South of France, Germany and Northern Italy. Keith has around 12 years riding experience and covers up to 10k a year on his bike socially before work miles. Keith has been working the Highlands as a Taxi driver for the last 13 years so has plenty of knowledge of the area and the best parts to visit. Keith is mainly tasked with the digital aspects of Haggis Tours when he is not touring. Alan has been riding various bike types for around 11 years and also covers fairly high mileage and is also an I.A.M. member. Alan has worked in the local area for many years as a Gas engineer and plumber during which he has gained a great knowledge of the area including some great remote locations. Alan is mainly tasked with the marketing side when he is not touring. Want to tour on your motorbike but dont want to go alone? Unsure of rules and regs? Dont know where to start? 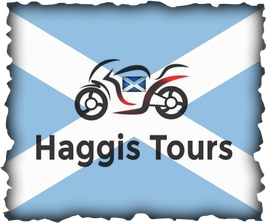 At Haggis Tours our aim is "Making Motorcycle Touring Simple" leaving you to relax and enjoy your motorcycle holiday whilst we take the stress of it all. Simply just Pay and Go. Coming from USA or another International Origin? We will meet you in a mutually convenient location and collect you/start the tour from there..
Our team here at Haggis Tours have all the knowledge required for your tour whether it be in Scotland/UK or in specific countries in Europe so you can just relax and enjoy the ride. Let us do the hard work from booking travel, accomodation, checking relevant paperwork and documents, ensuring the correct equipment is carried for each country etc. We may even shout the odd Beer from time to time.... We aim to book into accomodation that provides secure parking for your bikes overnight where possible, this usually consists of a private garage or within a covered courtyard or similar. Click here to see why you should book with us?